Summary for the Busy Executive: Strange imaginary landscapes. I seem to find myself on the outs with most classical-music lovers, simply because I don't a priori hate contemporary music. I find I keep saner by judging each piece as it comes and by remembering that at least eighty percent of all music is crap, including the music of the 18th and 19th centuries, the breeding ground of so many favorites. For every Brahms, there are scores of Waleskas. So I don't get on my high horse when I encounter a contemporary work that bores or irritates me nor mourn the loss of True Beauty in a Corrupt Age. 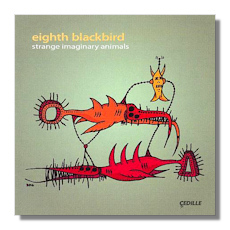 Furthermore, Eighth Blackbird is one of my favorite ensembles of any repertoire. Frankly, I'd want to listen to them in Mozart and Ravel, if they had any. However, for the most part, this disc – titled Imaginary Animals and decorated with wonderfully surreal line drawings by the composers – disappointed me, mainly because I so disliked most of the program. I might as well first clear out the stuff that didn't appeal to me. Canadian composer Gordon Fitzell simply bores me. I just don't get either violence or evanescence. If they're meant to convey his meditation on those two concepts, he would have done better to write an essay. The music is flat and about as shapely as gruel, pretty much what Seventies composers were doing, certainly no better. David M. Gordon's Friction Music I liked a little better. It kind of alternates between some lively passages and Music to Take Anacin By, incessant pounding for no good reason. Chances are high that in the next ten years all three scores will disappear, unmourned by anybody but the composers themselves and perhaps their parents. Dennis DeSantis's strange imaginary remix, however, shows real wit. Essentially, he turns Eighth Blackbird into a hip-hop beatbox, although far more sophisticated than the usual thing. The same goes for Steve Mackey's Indigenous Instruments – in the composer's phrase, "vernacular music from a culture that doesn't exist." The goofy first movement, where it seems none of the instruments are in tune with one another, I like best, but the poetic second movement comes close. For me, the star composition is Jennifer Higdon's Zaka, a piece of tremendous impulse and energy. Higdon strikes me, even at this early point in her career, as one of our best – a composer who can take the most advanced techniques and make expressive music, a combination of postwar devices fashioned by a prewar, Modernist, even neo-Romantic, sensibility. And it just sounds good. First-rank organizations commission her. Spano and the Atlanta Symphony have had modestly successful recordings featuring her work. To me, it's just a matter of recording enough of it, to disseminate it among the classical public. Here's hoping recording companies take the chance. Eighth Blackbird give stellar, committed performances, as always. They do what new-music groups should: they explore, and quite often, they bring back gold. Copyright © 2007, Steve Schwartz.